""Foxy is my name and playing is my game. I am a 7-month-old female Jack-Rat that is wound like a box spring! I love to jump, run and play. and have boundless energy throughout the day. I am smart, quick and fierce with a glowing personality and a zest for life.”—Our Foxy has been a wonderful addition to our family. Foxy is great with our young boys. She is very adaptable, aims to please and wants to be part of the family activities. And yes, she has an off switch. She can become an instant couch potato. She is the best of both worlds energetic and -lap dog. She is wonderful." The Jack-Rat Terrier is not a purebred dog. 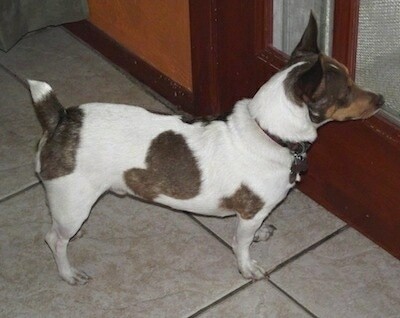 It is a cross between the Jack Russell and the Rat Terrier. The best way to determine the temperament of a mixed breed is to look up all breeds in the cross and know you can get any combination of any of the characteristics found in either breed. Not all of these designer hybrid dogs being bred are 50% purebred to 50% purebred. It is very common for breeders to breed multi-generation crosses. "Diva was born and raised her first three months in a fenced-in backyard with her mother, siblings and 6 other small-breed dogs. 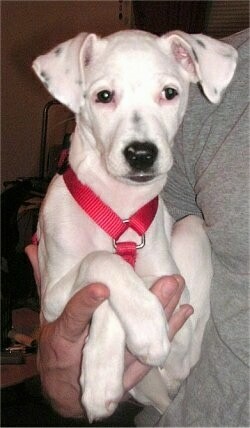 When I got her at three months she was very docile and timid. She wouldn't come to me or play and was very standoffish. This is a picture of Diva at 9 months old. That picture was after I had Diva for 6 months with her living with me in an apartment environment. That is about the time that she became totally "MY" dog. She has definitely become a "Daddy's Dog". She rarely leaves my side and loves to go everywhere I go. She travels well, responds to my commands, loves the outdoors and chasing squirrels, loves strangers, loves big dogs, never makes a noise other than when someone knocks and has become the love of my life." 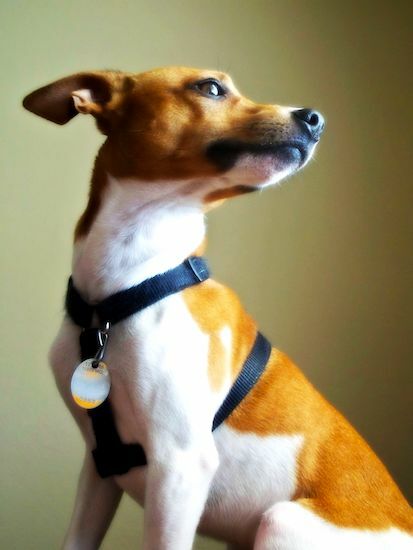 "Hippie the Jack-Rat Terrier at 1.5 years old now has more freckles, and cute as ever. Even though he is a hyper dog, he will sit as still as a mouse on my lap when I am at the computer. He continues to get along with our cats and loves to lie in the sun with his girl, our Beagle Reve. He cuddles on the couch and actually watches TV with us. He will even bark at other dogs when they are on. We watch the Dog Whisperer and funny home videos of pets. These are his favorite shows. I continue to crate him at night and when not home, for he has a dangerous curiosity. This is definitely the best dog I have ever had the privilege to love. He and Reve are truly a pair of sweeties. I love my companions!" Hippie the white and tan Jack-Rat Terrier as a puppy at 10 weeks old—"This is the smartest puppy and he loves to be held with his head on your shoulder. Now almost 3 months old, he loves to play with all 6 of our kids and other pets (cat Smokey and Beagle Reve). Beagle and Jack get along fabulously!" Hippie the white and tan Jack-Rat as a puppy at 6 months old—"He continues to be a joy and highly energetic. Trial and error led to the discovery that thin rolled long rawhides are best suited for his skinny little nose and jaw and he likes to hold them between his paws and gnaw at an angle. Fenced-in yard gives him ample play space and baby gates keep him in safe in indoor play areas. If you are thinking of owning this type of hybrid be prepared to supervise for many months, for they are explorers and playful and may pick inappropriate toys. Small stuffed animals without buttons or choking items are a favorite to toss around in the air and catch. It is winter here and small, lean-boned dogs such as terriers get cold easily. Warm indoor bedding and blankets near warm areas are best suited for these little bundles of energy and joy. Definitely a highly intelligent dog, have some small bite size treats handy, and they will learn tricks easily with baby praise, kisses, and a delightful morsel. So, if this is the dog for you, when your baby first comes home, cuddle and play with them a lot, have patience, give praise and they will continue to be affectionate for a lifetime." 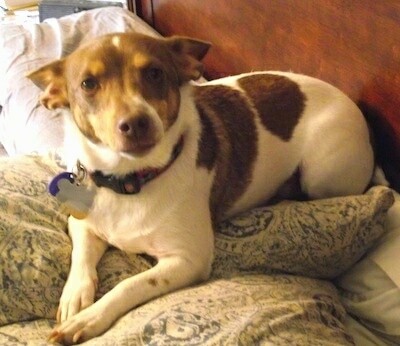 Lexi the adult Jack-Rat Terrier—her owner says, "Lexi's mother was a registered American Rat Terrier and her father was a registered Jack Russell Terrier. Lexi is 2 ½ years old in this picture. She has the typical temperament of the terrier breed. Training took time, but she has become a wonderful companion and watchdog." 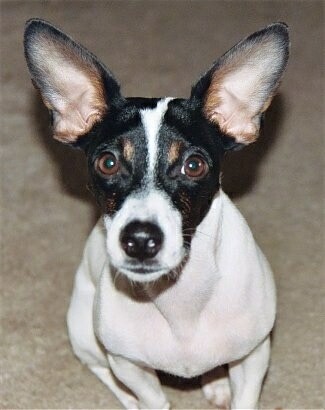 "This picture is of our ever-curious, spunky Caszie, a Jack-Rat Terrier! In the picture, she is approximately 2 years old. She is the smartest dog and is also quite neurotic! She is the only dog I have ever seen that attacks vacuums, chases light beams, tries to "get" windshield wipers, and chases animals on hunting shows! She knows upwards of 15 tricks, all of which were learned before she was 9 months old! Truly an amazing dog. Fiercely loyal, she was my pick at first, but then she took over my husband. I can't even get near him, or she'll try to get between us or, if she can't, she'll sulk off to the corner and sit there, looking sullen. She just cracks me up!!" 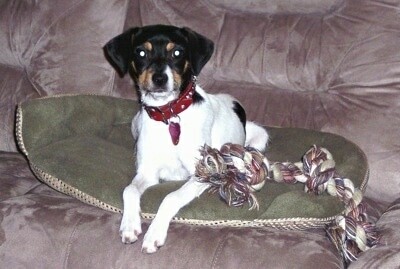 "Sparky is a Rat Terrier / Jack Russell shown here at 3 years old. Sparky's parents were registered purebreds. We got him when he was 6 months old. 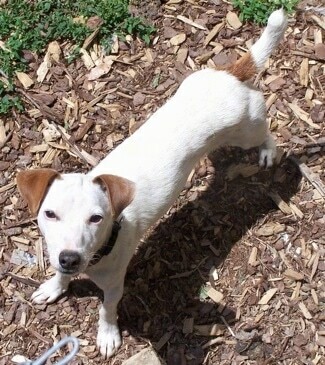 He has the JRT attitude and is the pack leader among the two of the dogs. (We have aCojack named Toby.) He is full grown and weighs about 11 pounds. Sparky is incredibility smart. Watching TV is his most favorite thing to do. On Sunday mornings he will wake us with kisses and then run to the end of the bed and look directly at the TV. Once we turn the TV on, he nestles himself into the covers and will watch TV all morning! Sparky is territorial and it took some time for him to adapt when we brought Toby home to him. Now that it's been a couple of years, him and Toby are soulmates and could never be separated." 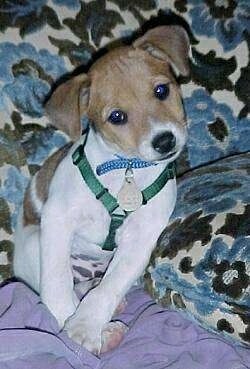 Mattie the Jack Rat as an 8-week-old puppy—Mattie is a crossbreed of a Rat Terrier (mother) and Jack Russell Terrier (father). This crossbreed is referred to as a Jack-Rat. 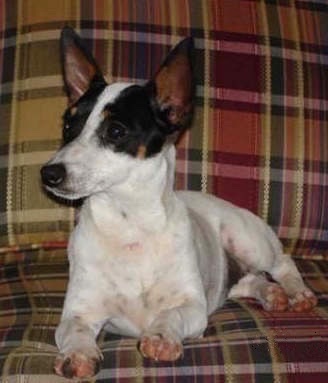 The freckles that show through her fur and her larger than typical 'Jack' ears are due to the Rat Terrier influence. 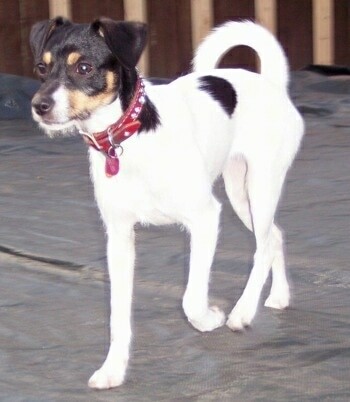 Roxy the white with black spots Jack-Rat Terrier—her father was a Jack Russell and her mother was a Rat Terrier. It is very rare for these dogs to be almost all white. 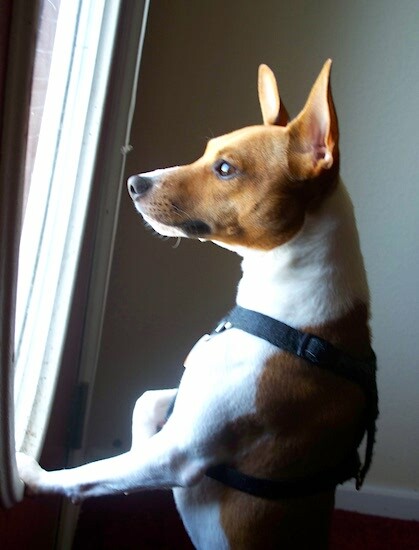 "Rufus the Jack-Rat at 2 years and 4 months old—he always seems to be posing for a picture and he loves to look outside and keep an eye on things." Rufus the Jack-Rat Terrier (Jack Russell / Rat Terrier mix) at 7 months old—"Rufus is always ready to play!!" Rufus the Jack-Rat Terrier (Jack Russell / Rat Terrier mix) at 7 months old—"It's so cute when Rufus does this little head tilt!" Rufus the Jack-Rat Terrier (Jack Russell / Rat Terrier mix) at 7 months old—"What a tongue you have, Rufus!!"